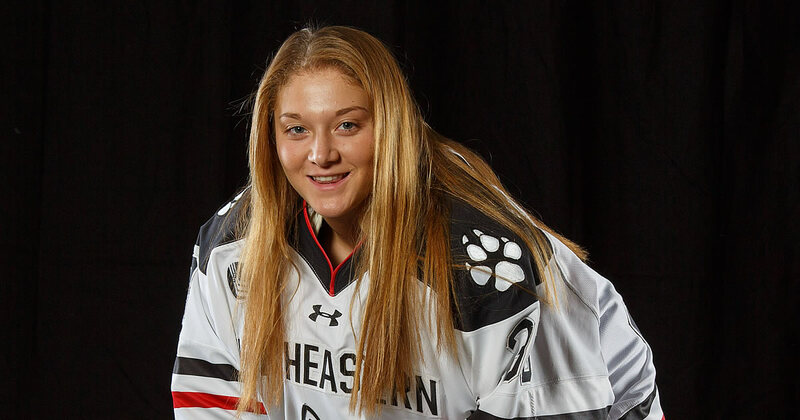 #9 Northeastern took three league points at Boston University, thanks in part to Aerin Frankel’s (Briarcliff Manor, N.Y.) 28-save shutout on Friday in a 5-0 win. The Terriers owned the nation’s longest scoring streak, as they avoided a shutout in each of their last 74 games dating ba ck to the 2016 WHEA championship game. UConn moved to 3-0-0 on the year, winning its opening Women’s Hockey East game at Vermont, 4-2. Providence stormed back from a 3-0 deficit on Saturday to sweep Bemidji State in a weekend homestand. Maureen Murphy (Buffalo, N.Y.) had a four-point (3g, 1a) weekend, including two unassisted strikes. Boston College bounced back with a 5-1 win over Syracuse on Saturday. Senior Makenna Newkirk (Scottsdale, Ariz.) picked up three points on one goal and two assists while putting five shots on net in the Eagles’ victory. Rookie goaltender Maddy McArthur (St. Catherine’s, Ont.) earned her first career win with 22 stops, including 11 in the third period. Maine won twice at Quinnipiac, riding three goals and an assist from Tereza Vanisova (Strakonice, Czech Republic). 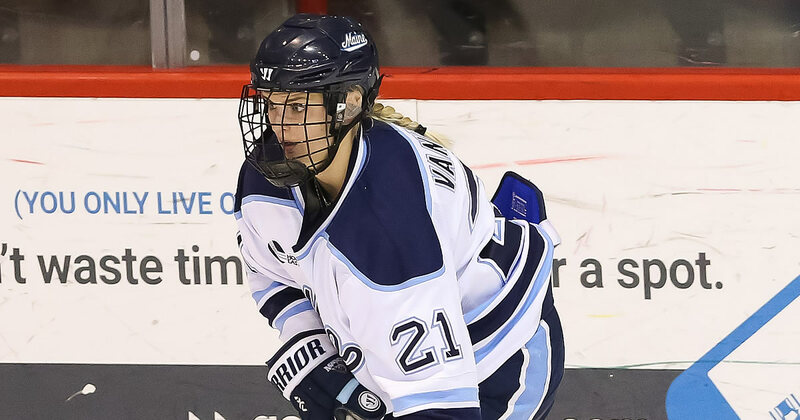 Vanisova clinched Friday’s game for the Black Bears with the overtime goal. New Hampshire went 0-1-1 against #10 St. Lawrence, feeding off of 65 saves from sophomore netminder Ava Boutilier (Charlottetown, P.E.I.) in two overtime contests. She allowed just two goals, posting a .970 save percentage and 0.92 goals against average in her first weekend of play. Tereza Vanisova (Jr., F; Strakonice, Czech Republic) scored three goals and had an assist in two road wins at Quinnipiac, including the game-winning goal in overtime on Friday night. She also found the back of the net with a shorthanded tally on Saturday. Gillian Foote (Fr., D; London, Ont.) led all Hockey East players with three assists, all on the power play, to help #9 NU to an undefeated weekend at BU. She began her collegiate career with a two-assist outing on Friday, including a helper on the game-winning goal in a 5-0 win. Aerin Frankel (So., G: Briarcliff Manor, N.Y.) kicked out all 28 shots she saw on Friday, becoming the first NU goaltender to shutout BU since 2011. The Terriers also hadn’t been shutout in their last 74 games, dating back to the 2016 WHEA title game, which was the nation’s longest such streak. Makenna Newkirk, BC (Sr., F; Scottsdale, Ariz.) Tallied three points on one goal and two assists while putting five shots on net in the Eagles’ 5-1 win over Syracuse. She won 11 faceoffs in the victory. Maddy McArthur, BC (Fr., G; St. Catherine’s, Ont.) Earned her first career win with 22 stops, including 11 in the third period, in a 5-1 outing against Syracuse. Grace Bizal, BC (Sr., D; Minnetonka, Minn.) Dished out two helpers in BC’s victory over the Orange, including setting up the decisive tally. Sammy Davis, BU (Jr., F; Pembroke, Mass.) Scored a goal and set up another in a 3-3 tie with #9 Northeastern on Saturday. She put a team-high 13 shots on net in her first games since the 2017 Hockey East semifinals. Courtney Correia, BU (Fr., F; Whitby, Ont.) Picked up her first collegiate point with an assist on BU’s opening goal of a 3-3 tie. 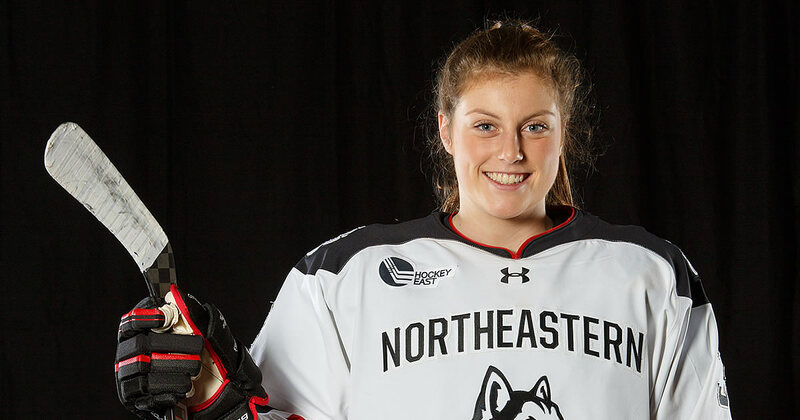 Natalie Snodgrass, UConn (So., F; Eagan, Minn.) Helped UConn to a 4-2 win over Vermont to open Hockey East play with an empty net goal and an assist. Taylor Wabick, UConn (So., D; Winnipeg, Man.) Assisted on the equalizer for the Huskies while helping the UConn penalty kill deny three Vermont power plays within a six-minute frame in the third period to secure the win. Liga Miljone, ME (Fr., F; Riga, Latvia) Potted her first career goal on Saturday against Quinnipiac, which proved to be the decisive tally, and dished out an assist on Vanisova’s short-handed strike. Loryn Porter, ME (So., G; North Bay, Ont.) Earned her first career shutout with a 14-save, 3-0 win against Quinnipiac on Saturday. It was Porter’s fifth career NCAA start and shut down five Quinnipiac power-play opportunities. Ava Boutilier, UNH (So., G; Charlottetown, P.E.I.) Stopped 65 shots across two games of work, allowing just two goals in an 0-1-1 weekend against #10 St. Lawrence. She posted a .970 save percentage and 0.92 goals against average in her first weekend of play. Veronika Pettey, NU (So., F; Potomac, Md.) Lead NU and tied for the league lead with four points (2g, 2a) in a 1-0-1 weekend against WHEA foe Boston University. She struck twice on the power play and set up another goal with an extra attacker across the two games, and scored the game-tying goal in Saturday’s 3-3 draw. Maureen Murphy, PC (So., F; Buffalo, N.Y.) Enjoyed a four-point (3g, 1a) weekend in a sweep of Bemidji State, including two unassisted strikes in game two. She finished a plus-three rating and fired 10 shots on net in the series. Her two goals in game two helped spark a 5-4 come-from-behind win after Providence fell in a 3-0 hole. Sara Hjalmarsson, PC (Fr., F; Bakeryd, Sweden) Picked up an assist in her first game as a Friar on Oct. 5 and netted her first collegiate goal the following day against Bemidji State. She put seven shots on net across two games and finished plus-four. Lilly Holmes, UVM (Fr., F; Saratoga Springs, N.Y.) Scored her first career goal on Saturday, netting a shorthanded strike against UConn. Melissa Black, UVM (Sr., G; Newmarket, Ont.) Stopped 32 shots, including 13 against the UConn power play, in a 4-2 loss.